This set is truly amazing; the burner has a beautiful green hue with black and clear gems accents. The white top adds the right amount of contrast to blend into any existing décor. The clamshell melt pack comes with 6 melts and a bonus white layer of one of our new house blend of scents called magic. Yes try magic on us. Just break apart pieces and you can melt it by itself or you can add it to the colored melt for a party of aromas. 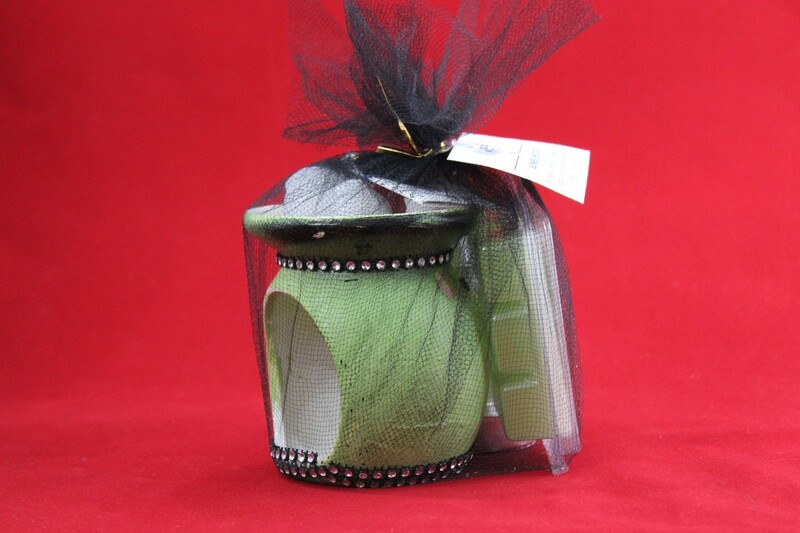 Color: Melter-Green with black & Clear Gems. Clam-shell-Green & White Wax.Heart Shaped Wax Melts-Red & White Wax.